A pathological increase in the medial angulation between the neck and the shaft is called coxa valga, and a pathological decrease is called coxa vara. 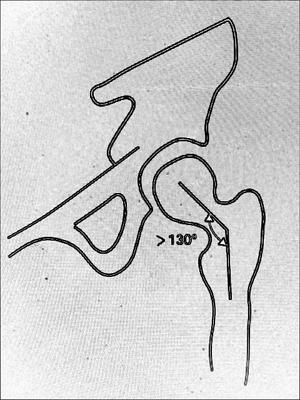 The angle of inclination of the femur averages 126 degrees ( referencing the medial angle formed by the axes of the head/neck and the shaft ), ranging from 115-140 degrees in the normal adults. As with the angle of inclination of the humerus, there are variations not only among individuals but also from side to side. In women, the angle of inclination is somewhat smaller than in men, owing to the greater width of the female pelvis. With the normal angle of inclination, the greater trochanter lies at the level of the center of the femoral head. The angle of inclination of the femur changes across the life span, being substantially greater in infancy and childhood and gradually decline to about 120 degrees in normal elderly person. In Dysplastic Hip structural deviations of femoral anteversion, coxa valga, and a shallow acetabulum can result in increased articular exposure of the femoral head, less congruence and reduced stability of the hip joint in neutral weight bearing position. If hip dysplasia is diagnosed in infancy then frog leg positioning can help using something like Frejka pillow or Pavlik harness to decrease the deformity by increasing the contact between the femoral head and acetabulum. The position of combined flexion, abduction and rotation is commonly used for immobilization of the hip joint when the goal is to improve articular contact and joint congruence in conditions such as congenital dislocation of the hip and in Legg-Calve-Perthes disease.